Founded in 1938 by Arne Dellgren and Bernt Bjurklint in Halland, Sweden, Hafi continues as a family owned and operated business into its fourth generation. Hafi brought together the community in a shared effort; local growers provided fresh ingredients and Arne's mother, Frida, designed the beautiful labels. Although Hafi has grown considerably over the years, the company remains committed to the standards of quality and expertise that have always set it apart. 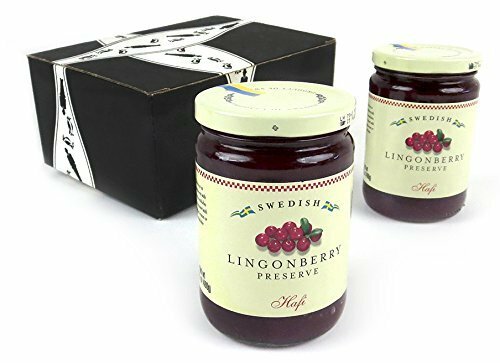 Now get a BlackTie Box for any occasion featuring two 14.1 oz jars of Hafi Lingonberry Preserves. By Friend in Cheeses Jam Co.